A book of Stoeckley’s vivid sketches from inside the court and beyond, accompanied by select transcripts from the trial. The Cecille R. Hunt Gallery at Webster University will exhibit Clark Stoeckley: The United States vs. Private Chelsea Manning from Nov. 4-Dec. 10, 2016. The opening reception is Friday, Nov. 4, 2016, beginning at 6 p.m. Drawing in real time from inside the courtroom, artist, activist and Webster alumnus Clark Stoeckley captured first-hand the extraordinary drama of the Manning trial, one of the most important and secretive trials in American history. 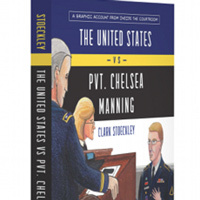 In the course of the trial, Private Manning insisted that her release of State Department cables, Collateral Murder video, and Iraq and Afghanistan war logs to WikiLeaks was an act of conscience, justified by the urgent need to reveal to the world the atrocities committed by the U.S. military in the ostensible cause of freedom. At the prosecution table, military lawyers for the American government sought to set an example and discourage future whistleblowers by locking away Manning for decades, possibly the rest of her life. Stoeckley’s vivid sketches from inside the court and beyond, trace the evidence, witness testimony, and arguments as they move back and forth between the defense and the prosecution. This show consists of 286 drawings. Clark Stoeckley received a BFA in Alternative Media from Webster University and an MFA in Performance and Interactive Media Art from Brooklyn College. His work has been shown at the Contemporary Museum St. Louis, Pratt Manhattan Gallery, Emily Harvey Gallery, and Plato’s Cave and featured in ARTnews, Art in America, and The Wall Street Journal. He teaches Serigraphy, Protest Art, Computer Imaging, Experimental Digital and Analog Media, Painting, and Drawing at Bloomfield College in New Jersey. All Cecille R. Hunt Gallery events are free and open to the public. Cecille R. Hunt Gallery of Webster University is located at 8342 Big Bend Blvd, St. Louis, MO 63119. Exhibition Hours are: Tuesday-Saturday 10 a.m.-5 p.m.